President Trump tweeted last week that licenses for TV networks airing what he calls "fake" news "must be challenged and, if appropriate, revoked." Ajit Pai, the chairman of the Federal Communications Commission that handles licensing, says he doesn't have the authority to do that. On Tuesday Pai made his first public remarks about Trump's threatening tweets. "I believe in the First Amendment. The FCC under my leadership will stand for the First Amendment," Pai said in an appearance at George Mason University. Pai just stated the obvious -- but it was newsworthy because he hadn't said anything for nearly a week. "Under the law, the FCC does not have the authority to revoke a license of a broadcast station based on the content of a particular newscast," he said. Trump's tweets implied that he wants a change. Last Wednesday he tweeted: "With all of the Fake News coming out of NBC and the Networks, at what point is it appropriate to challenge their License? Bad for country!" Later in the day he went further by saying licenses "must be challenged and, if appropriate, revoked." Trump's comments horrified many First Amendment advocates and former FCC commissioners. But Pai, a Republican who was appointed chairman by Trump earlier this year, did not respond to requests for comment in the days that followed. One of the five current commissioners, Democrat Jessica Rosenworcel, said her colleagues should speak out. "I do think that history won't be kind to silence," she said Sunday on CNN's "Reliable Sources." "I think it's important for all the commissioners to make clear that they support the First Amendment, and that the agency will not revoke a broadcast license simply because the president is dissatisfied with the licensee's coverage." On the program, Pai's immediate predecessor, the Obama-era FCC chairman Tom Wheeler, called Pai's silence "shocking." Pai "is making himself complicit in the coercion that the president was engaging in," Wheeler said. On Monday another Democrat, Senator Richard Blumenthal, weighed in. "You have a duty to condemn this attack," Blumenthal said in a letter to Pai. At the university event on Tuesday, Pai did not condemn Trump's tweets. In fact, Pai didn't mention the president by name at all. 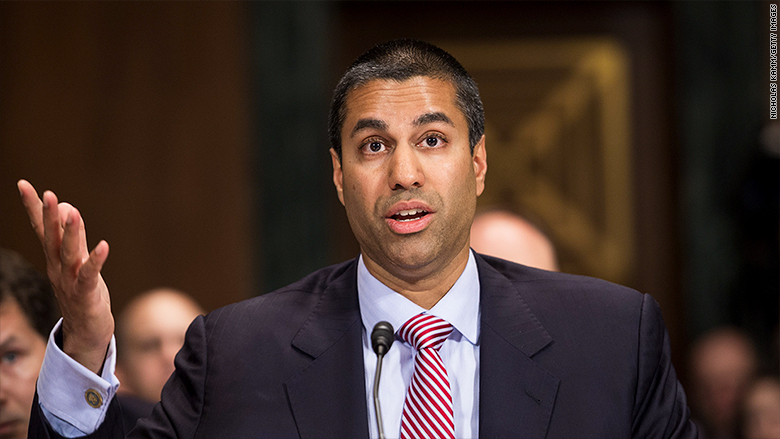 When he was asked a follow-up question about whether there's a role for the FCC in "deciding what's fake news and doing something about it," Pai said, "Traditionally that has not been within the FCC's jurisdiction."